$12 for a beer & six oysters from 5-7 pm every day (closed on Mondays). We each had a beer and six oysters. I chose the Keegan Ales Mother’s Milk Stout with 3 Mobjack and 3 Beaver Tail oysters. Chris Cuzme had the Southampton Keller Pils, 1 Malpeque, 1 Mobjack, 2 Marin Miyagis and 2 Elkorn oysters. The bartenders: Extremely nice. Both owners were there as well as a bartender and all were very helpful – excellent service all around. The crowd/atmosphere: About a quarter full when we walked in around 6:15 on a Tuesday and almost to capacity when we walked out around 7:15. Low-key diverse crowd – lots of couples, some singles and one family. The room is lovely – a deep rectangle with a brick wall to the left and a wood wall on the right, a black & white tile floor and vintage fans on the ceiling. A sanctuary from the city with a laid-back, timeless feel. Overall: Super sweet deal. The Keegan and the Southampton are normally $6 and the oysters range from $2 to $2.75 each. Our bill would have been $43.25 (before tax) without the happy hour deal, so we saved an impressive 45% off of our bill. There are eight tap lines that rotate frequently. There were 19 oyster varieties available on our visit and the oysters we chose were extremely fresh and clean. The owners were very congenial, passing out free samples of beer (without being requested) and free samples of whiskey cake after our oysters. We weren’t able to stay for dinner but are planning to go back very soon – the menu and dishes that passed by us looked delicious. A highly recommended craft beer happy hour for oyster lovers. The Westchester Homebrewers Organization held their January meeting tonight at the new Captain Lawrence brewery in Elmsford. The new brewery is impressive – a nice step up for Owner/Brewmaster Scott Vaccaro & gang. The tasting room is fabulous – with lots of room to move around and a gorgeous bar. I look forward to returning soon when the taps are flowing. Oh, and the WHO meeting was awesome as well. The theme was mead – Bob Slanzi gave a lecture on beekeeping, Phil Clark on traditional mead making, Ken Hettinger on mead making with staggered nutrient additions and some excellent mead was poured afterward. Three cheers for mead! Weekly picks coming Tuesday, December 13! First, Rattle n Hum is offering $5 New York state beers all week long. Stop by and catch up on what you missed last week! Tuesday the 27th: Let’s start with one of my favorite weekly events, the $10 Tuesday tasting at Jimmy’s No 43. This week, Mike Lovullo will take you through a series of “Octoberfest-ish” beers starting at 7:30 pm. The line-up includes Weisenhoe Monk’s Fest, Mahr’s Dunkel Lager, Schneider Edel Weisse, Schlenkerla Krausen, Nils Oscar Kalasol & Smuttynose Mai Bock. But before that, join Dann & Martha Paquette of Pretty Things for the Beer Tasting Tuesday at dbgb. Drop in anytime between 5 & 7 pm for a 3-course beer & food pairing in the bar area – $25/person. In Brooklyn, The Vanderbilt has paired with Sixpoint for a beer pairing dinners. The four-course meal begins at 7:30 pm and costs $60/person – please call 718-623-0570 to reserve your spot. Wednesday the 28th: Tonight’s a great night to learn more about one of my other favorite beverages – coffee! Edible Brooklyn is presenting a How to Roast! discussion at the Brooklyn Brewery tonight. There will be lectures & samples from Blue Bottle, Dallis Bros & Gorilla Coffee companies. Admission is $5 and you can purchase pints of Brooklyn beers for only $4 during the event. And on the Upper East, David Copperfield’s House of Beer is hosting their 14th Annual Oktoberfest. Col. Hoppy Monster – A heavy handed Dry Hop blend of Organic Cascade, Willemette, and Chinook hops from Upstate NY. This one is for the Colonel. Big Apple Mint – Apple’s and Mint in a tribute to the city it was born in. Soft fresh leafy green and tart sweetness. Kombuchelada – Jalapeno, Lime and Sea Salt. A kombucha fiesta! Where’s the tequila. Minerality and citrus meet their spicy match in this balanced addicting brew. Blueberry Bonanza – Blueberries and Lemon Juice alongside a soft bunch of Cascade Hops. Floral, perfectly sweet and down right delicious. E-Z Rider – Birch, Indian Sarsaparilla, licorice, vanilla bean and spruce. This is a dedication to the newest member of the KBBK family. Deep complex root flavor balanced by a light vanilla bean middle and a medium body tannic finish. Kevin Bacon – Because he is in everything but a keg of ‘buch. Until today. Bitter Orange peel tangled with sweet orange peel, on top dried rose petals. We salute you Mr. Bacon. Reverse Toxmosis cocktails will also be available. I know that Grab Specialty in South Slope is having a Wandering Star tasting this afternoon – stay tuned for details – featuring the Raindrop Pale Ale, Mild at Heart, Bash Bish Bocktoberfest, Alpha Pale Ale and the Berkshire Hills 01201 Saison. 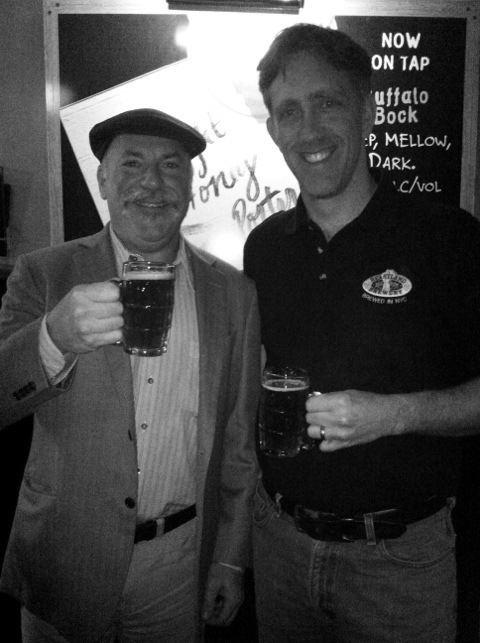 I will be in Montclair, New Jersey teaching a class on Off-Flavors in Beer at Amanti Vino. I’m really excited – this is one of my favorite classes to teach & it should be a ton of fun! It’s almost full but if you’re interested, call 973-509-9463 to see if there’s a spot left. Also beginning today is the 9 day Oktoberfest Celebration at the Bohemian Hall & Beer Garden in Queens. Sunday the 2nd: Today is one of my favorite events of the year – the Atlantic Antic. This is not your typical NYC street festival! It’s full of fantastic food from local restaurants, live music, craft beer, vintage MTA buses, awesome local arts & crafts and fun, fun, fun! The Antic runs from Fourth Ave to Hicks St from noon to 6 pm. I will be there early to eat, drink, shop & boogie my way down Atlantic Avenue. 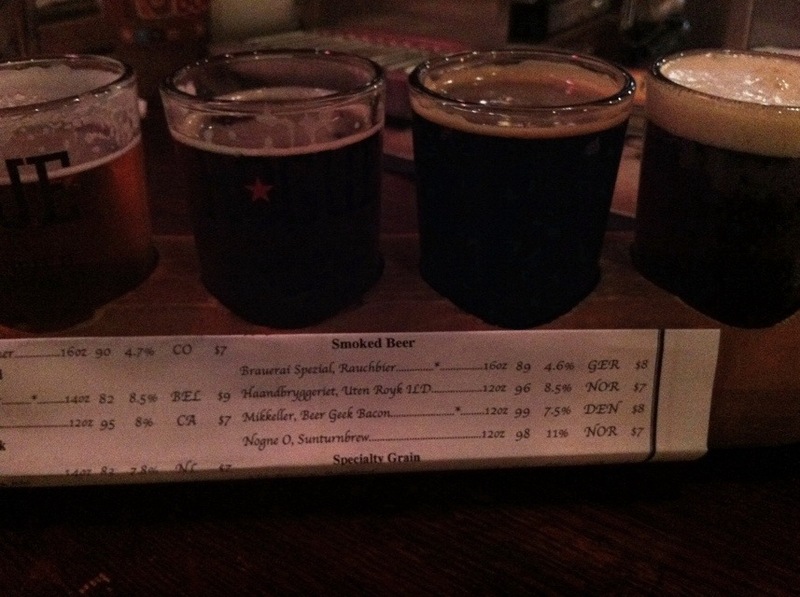 Flight of smoked beers at Rattle n Hum. The Spezial & Beer Geek Bacon are my faves. Delish! NEW YORK, May 27, 2011 /PRNewswire/ — Get Real NY today announced that it will hold its 1st Annual Belgian Beer Festival at the historic Altman Building on Friday, July 8, 2011 and Saturday, July 9, 2011. As attendees have come to expect of a Get Real NY beer fest, the Belgian Beer Festival will include two days of all-you-care-to-consume Belgian-style brews and homebrews, live music, interactive tasting panels and plenty of good Belgian eats. The event serves as a celebration of Belgian brewing and an introduction to some popular beer styles that are taking the craft beer world by storm. This granddaddy of Belgian beer festivals will feature 100+ of the most diverse, unique and hard-to-find Belgian and Belgian-inspired brews around from craft breweries at home and abroad. We’re talking Sours, we’re talking Trappists, we’re talking Dubbels, Tripels and Quads, we’re talking Gueuze, we’re talking Lambics and Flanders-style, basically we’re talking about one of the largest collection of Belgian-style beers ever assembled under one roof. Attendees can expect rare finds from breweries like Cantillon, De Ranke, Hitachino, Rodenbach, Jolly Pumpkin, Lagunitas, Cigar City, Allagash and tons more! To help wash down all the amazing beer, there will be plenty of tasty Belgian bites on hand from local NYC restaurants and artisanal food shops, including mussels, oysters, artisanal cheeses and meats, chocolates, Belgian waffles, pommes frites, bratwurst and more. The two-day event kicks off on Friday, July 8th with the “Sour Sessions” (3-6 P.M. and 8-11 P.M.) featuring a special section with dozens of sour brews including plenty of gueuze and lambics. The all-you-can-taste fest continues Saturday, July 9th with the “Extreme Belgian Sessions” featuring an epic selection of rarefied, funky beers that push the boundaries of brewing. There will also be three VIP sessions (Friday 7-11 P.M.; Saturday 2-6 P.M. & 7-11 P.M.) with exclusive and limited quantity beers, special foods and tasting panels. New at this festival will be the Belgian Beer Hall with communal tables reminiscent of a European beer garden where attendees can unwind with some good beers, good food, good music and good company. Each $85 general admission ticket comes with a souvenir glass, unlimited tasting pours, a fest beer guide, unlimited food sampling, live music, tasting panels and all the beer education you can handle. The $115 VIP tickets will include everything above in addition to one-hour early access to the festival, admission to a special VIP tasting room featuring several rare and hard-to-find beers and access to brewery tasting panels and discussions. 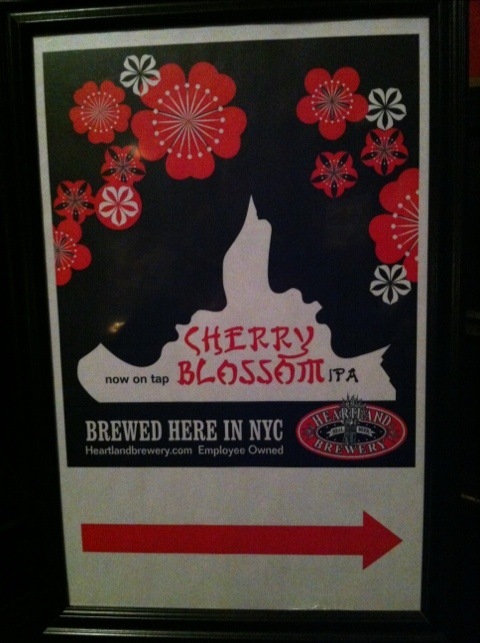 The beer and food lineup will be continuously updated on the festival website at http://www.grbfny.com. Get Real NY does not oversell its festivals! As such, tickets are extremely limited and both sessions will SELL OUT. General Admission tickets are $85 and must be purchased in advance. VIP tickets are $115 and also must be purchased in advance. For three days only, beginning Friday, May 27, 2011, General Admission tickets will be offered for $75 and VIP tickets will be offered for $100, and only through BeerMenus.com and Yelp. After this initial offer period expires, there will be no further price reductions through online coupon sites and all General Admission tickets will be $85 and VIP tickets will be $115 until sold out. So come discover why we personally think Belgian brews are some of the most intriguing styles of beer on the planet during two glorious days of tasting, fun and beer education. Get Real NY is a NYC-based festival production company focusing on the celebration of the best craft beer and local, artisanal food available. In addition to the Get Real NY Craft Beer & Food Experience, Get Real NY has plans for a Get Real Cask Ale Festival and an All-American Craft Beer Festival later this year. Disclaimer: I am extremely proud to be a part of the Get Real NY company – financially & otherwise.